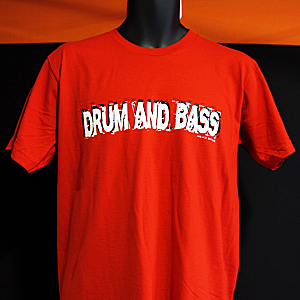 Awesome Drum and Bass T-Shirt from Head Space. 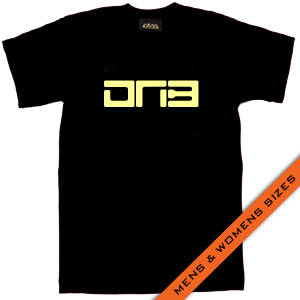 Black t-shirt with a�fluro green yellow and orange DNB logo on the front and fluro green�HEAD SPACE on the shoulder. All�glow under UV!�Sizes up to 5XL. Awesome Drum and Bass T-Shirt from Head Space. Black t-shirt with a glow in the dark�DNB logo on the front and glow in the dark HEAD SPACE on the shoulder.�Sizes up to 5XL. Awesome Drum and Bass Hoodie from Head Space. 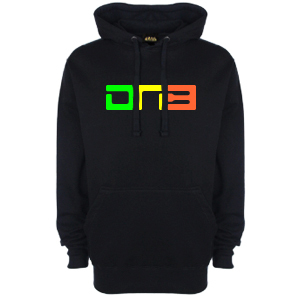 Black Hoodie�with a�fluro green yellow and orange DNB logo on the front and fluro green�HEAD SPACE on the shoulder. All�glow under UV! Awesome Drum and Bass Hoodie from Head Space. 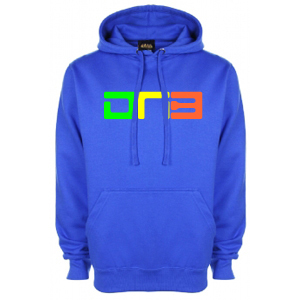 Royal Blue�Hoodie�with a�fluro green yellow and orange DNB logo on the front and fluro green�HEAD SPACE on the shoulder. All�glow under UV! The Fun Starts at 200BPM�T-Shirts from Head Space!�Black t-shirt with a white and fluro orange logo on the front and fluro orange�HEAD SPACE on the shoulder. Both glow under UV!�Sizes up to 5XL. The Fun Starts at 200BPM�T-Shirts from Head Space!�Black t-shirt with a white and fluro yellow�logo on the front and fluro yellow�HEAD SPACE on the shoulder. Both glow under UV!�Sizes up to 5XL. The Fun Starts at 200BPM�T-Shirts from Head Space!�Black t-shirt with a white and fluro pink�logo on the front and fluro pink�HEAD SPACE on the shoulder. Both glow under UV!�Sizes up to 5XL. If Drum and Bass is your thing, you shouldn't be without this brand new clean cut t-shirt from Head Space. 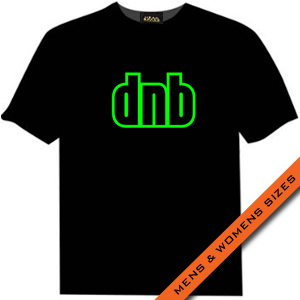 Complete with fluro green dnb logo and�fluro green HEAD SPACE on the shoulder. All glow under UV! Sizes up to 5XL. If Drum and Bass is your thing, you shouldn't be without this brand new clean cut t-shirt from Head Space. Complete with fluro pink dnb logo and�fluro pink HEAD SPACE on the shoulder. All glow under UV! Sizes up to 5XL. Ramp it up! How fast can you�want it! Black t-shirt with fluro text. Sizes up to 5XL. 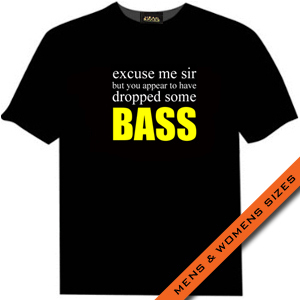 "excuse me sir, you appear to have dropped some BASS" White and Florescent Yellow design on a black t-shirt! Sizes up to 5XL. Love it over 160 ? Bass you can feel in your pants ? HEAD SPACE�Drum and Bass�T-Shirt's for you�! 100% Cotton T.�Part of the Head Space slimmer fit range. Only Medium Left! If Drum and Bass is your thing, you shouldn't be without this brand new clean cut t-shirt from Head Space. Complete with Limited Edition Gold dnb logo and�Gold�HEAD SPACE on the shoulder. Sizes up to 5XL. 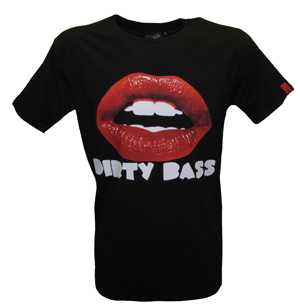 Twisted Beak screen printed Dirty Bass T-Shirt with the Twisted Beak name and logo on reverse. 100% Pure design from Head Space in�Grey and Fluro Orange�(glows under UV!) Black�t-shirt, also with�a Fluro Orange HEAD SPACE on the shoulder! Sizes up to 5XL. 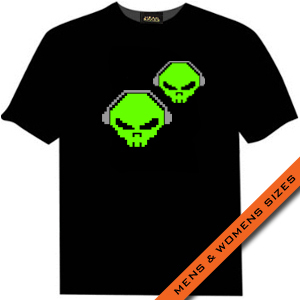 Awesome Head Space 8-Bit Alien Skull Headphones design�on a�black t-shirt. Fluro�green and grey logo on the front and fluro green HEAD SPACE on the shoulder. Both glow under UV! Sizes up to 5XL. Awesome Head Space 8-Bit Alien Skull Headphones design�on a�black t-shirt. Fluro yellow�and grey logo on the front and fluro yellow�HEAD SPACE on the shoulder. Both glow under UV! Sizes up to 5XL. 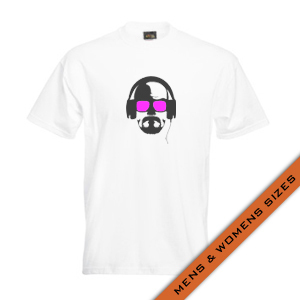 HEAD SPACE�Walter White Headphones T-Shirt.�White�t-shirt with a black and fluro pink (glows under UV lights!)�design. Plus a Black�HEAD SPACE on the shoulder! Sizes up to 5XL. 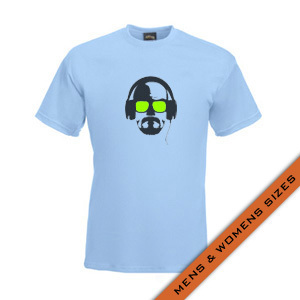 HEAD SPACE�Walter White Headphones T-Shirt. Sky Blue�t-shirt with a black�and fluro green�(glows under UV lights!)�design. Plus a Black�HEAD SPACE on the shoulder! Sizes up to 2XL. HEAD SPACE�Walter White Headphones T-Shirt. Yellow�t-shirt with a black�and fluro orange�(glows under UV lights!)�design. Plus a Black�HEAD SPACE on the shoulder! Sizes up to 2XL. HEAD SPACE�Walter White Headphones T-Shirt. Grey�t-shirt with a black�and fluro yellow�(glows under UV lights!)�design. Plus a Black�HEAD SPACE on the shoulder! Sizes up to 5XL. "excuse me sir, you appear to have dropped some BASS" White and Florescent Pink�design on a black t-shirt! Sizes up to 5XL. 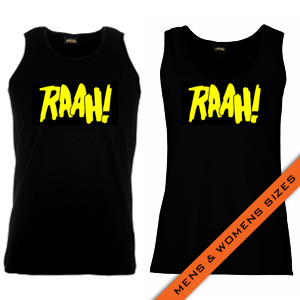 The Fun Starts at 145bpm vests�from Head Space.�Black vest�with a white and fluro yellow logo on the front and small fluro yellow HEAD SPACE on the back. Both glow under UV! The Fun Starts at 145bpm vests�from Head Space.�Black vest�with a white and fluro pink�logo on the front and small fluro yellow HEAD SPACE on the back. Both glow under UV! Play Hard Party Harder Vest from Head Space. Black vest with a fluro green logo on the front and small fluro green HEAD SPACE on the back. Both glow under UV! Play Hard Party Harder Vest from Head Space. Black vest with a fluro pink logo on the front and small fluro pink HEAD SPACE on the back. Both glow under UV! HEAD SPACE Skankin' It Up black vest with White and Fluorescent Yellow logo on the front and a small fluro yellow HEAD SPACE on the back. Both glow under UV! HEAD SPACE Skankin' It Up black vest with White and Fluorescent Pink logo on the front and a small fluro pink HEAD SPACE on the back. Both glow under UV! "excuse me sir, you appear to have dropped some BASS" White and Florescent Yellow design on a black vest! "excuse me sir, you appear to have dropped some BASS" White and Florescent Pink design on either a black or navy vest! �Love it over 160 ? Bass you can feel in your pants ? HEAD SPACE�Drum and Bass�T-Shirt's for you�! 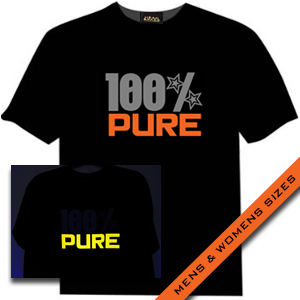 100% Cotton T.
RAAH! t-shirt from Head Space.�Fluro yellow�(glows under UV!) design�on a black�t-shirt. Plus a�fluro yellow�HEAD SPACE on the shoulder!�Sizes up to 5XL. RAAH! t-shirt from Head Space.�Fluro pink�(glows under UV!) design�on a black�t-shirt. Plus a�fluro pink�HEAD SPACE on the shoulder!�Sizes up to 5XL. RAAH! vest from Head Space. Fluro pink (glows under UV!) design on a black vest. Plus a small fluro pink HEAD SPACE on the back! RAAH! vest from Head Space. Fluro yellow (glows under UV!) design on a black vest. Plus a small fluro yellow HEAD SPACE on the back! Wasted T-Shirt�from Head Space! Black t-shirt with a�fluro yellow logo on the front and fluro yellow HEAD SPACE on the shoulder. Both glow under UV! Sizes up to 5XL. Wasted T-Shirt�from Head Space! Black t-shirt with a�fluro orange�logo on the front and fluro orange�HEAD SPACE on the shoulder. Both glow under UV! Sizes up to 5XL.